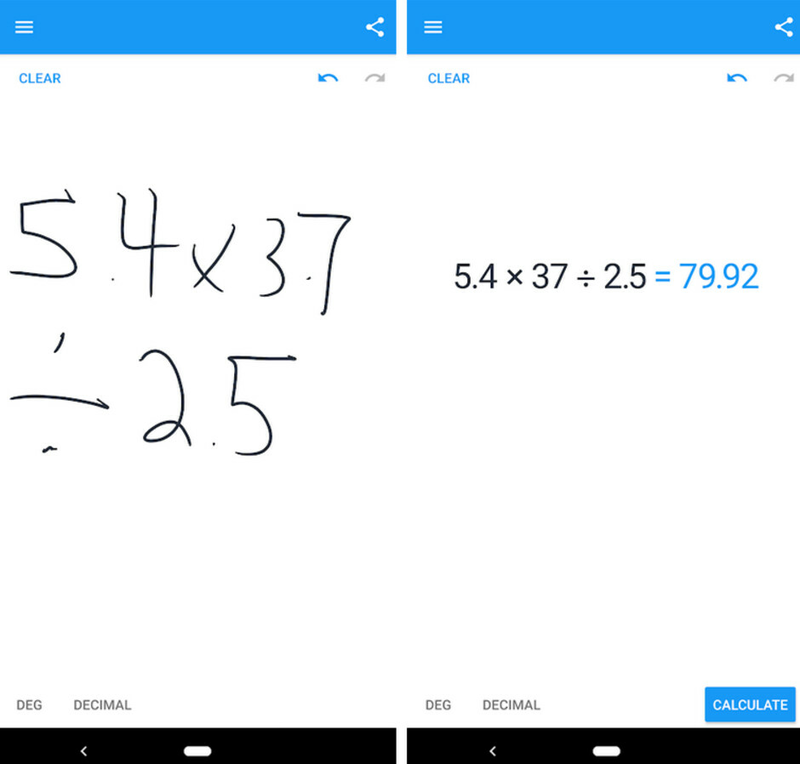 If you miss those days of writing down your math problems with a pencil and a piece of paper, you're probably going to love the MyScript Calculator 2 app (via Android Police). Unlike other calculator apps that use the number keys and some other symbols from your virtual or physical QWERTY keyboard, MyScript Calculator 2 uses your finger-written equations and instantly comes up with the answer. You can scratch out digits if you want to change a number in the equation, draw the percentage symbol (%) to calculate a percentage, and a "?" can be used as a variable. You can also drag and drop numbers, and even if an equation uses multiple lines, it is still treated as one problem to be solved. When you install the app, you'll go through a brief tutorial. Once you grasp the concept, you use your finger to write out equations on the touchscreen display of your iOS or Android phone. The equation is read by the app and quickly converts from your handwriting to an easy to read text. And just as fast, the answer appears on the screen. You can even do square roots, algebra, trigonometry and more. Calculations and answers can be saved, and any problem can be shared to friends, family or social media. Now here's a math problem for you. What is $2.99-$2.99? The answer, of course, is zero. And that is how much you have to pay to install the the MyScript Calculator 2 app on your Android phone for the next week. After that, it will cost $2.99 to download from the Google Play Store. Those with an iOS device have to pay $2.99 for the app right now. It's not free on iOS in the UK. all the surveys points that apple users are richer and smarter than the android ones so it's only fair that you pay for everything and more. I have had the original MyScript Calculator on my Note phones for the last few years and I love it. Simple to use and it understands exactly what you write, even if you can't read your scribbles. I look forward to using this new version. It is not free on iOS. Was able to get it for my droid. Not free in Jamaica on iOS. Probably US only. Seems like a must have app, especially if you have a Samsung note or similar styles device. Would this be very handy though?? Seems like an extra step to me. It used to be free on iOS. I have been using this app for years on my iPhone and iPad. I got it free.